Most of you know that I’m a book lover. I’ve published three children’s books and continue to work on other projects. Even before I was a writer, though, I was a reader. I don’t use an e-reader, and one of the joys of reading actual books is going to a bookstore to buy them. Ever since I was a university student who rewarded herself for finishing big projects with a new book, I’ve gravitated to small, independent bookstores. There’s nothing like getting to know the staff personally, and having them recommend books based on what they know I’d love. That’s why I’m thrilled to say that I’ll be participating in the first Canadian Authors for Indies Day. This celebration lets authors thank independent booksellers for both their hard work and their passion for the written word. We’ll show our support by working in their stores for an hour or two, and by talking to customers about some of the books we love. If you live in the Etobicoke/Toronto area and would like to join me, I’ll be at A Novel Spot bookstore at 270 The Kingsway between 2:00 and 4:00 on Saturday, May 2. I’m looking forward to recommending some of my favourite books, and to meeting the other great authors who will be there. And if you love to read but don’t live in Toronto, please visit your favourite local bookstore on May 2 – or on any day! On the topic of books, I hosted my book group this past week. We had a great discussion about a terrific book. (If you haven’t read Station Eleven, why don’t you pick it up on May 2?) And I served these two delicious, make-ahead appetizers. 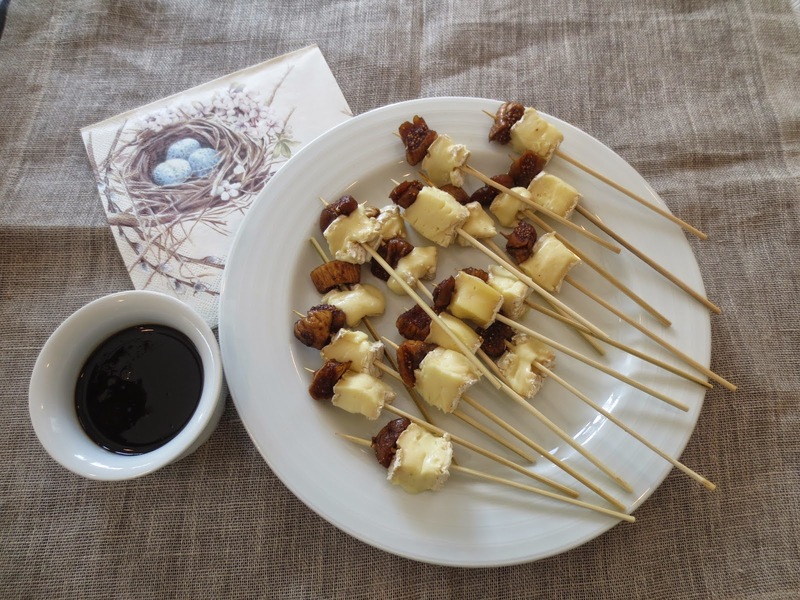 Cut cheese into 48 cubes and thread 1 piece onto each of 48 skewers. In small saucepan, heat orange juice and balsamic vinegar over medium-high heat. Add figs and simmer until slightly softened, about 5 minutes. Using slotted spoon, transfer figs to sieve set over bowl. Bring orange juice mixture to boil; reduce heat and simmer until reduced to 1/2 cup, about 20 minutes. Stir in sugar. Transfer to serving bowl and let cool. Thread fig pieces onto skewers alongside cheese. Serve with sauce for dipping. Cut eggplants lengthwise into 1/4 inch thick slices, discarding outermost slices with skin. Sprinkle all over with salt and arrange in single layer on baking sheets. Brush both sides of eggplant with oil; bake on parchment-paper lined baking sheets in 400 degree oven, turning once, until golden and softened, about 25 minutes. Let cool. Remove skin with a sharp paring knife. Meanwhile, in bowl, mash together goat cheese and cream; set aside. Place 1 Tbsp filling at one end of eggplant strip and top with a mint leaf. Roll up to enclose stuffing. Skewer rolls with toothpicks. Serve at room temperature or chilled. I do love to read but unfortunately only seem to have (or find) time when I am traveling. I wish I read more! I should make that a goal!! Those fig appetizers look amazing. Delicious! Have a great week and wish I were closer so I could drop by the bookstore. Love this post! Station Eleven is on my list! 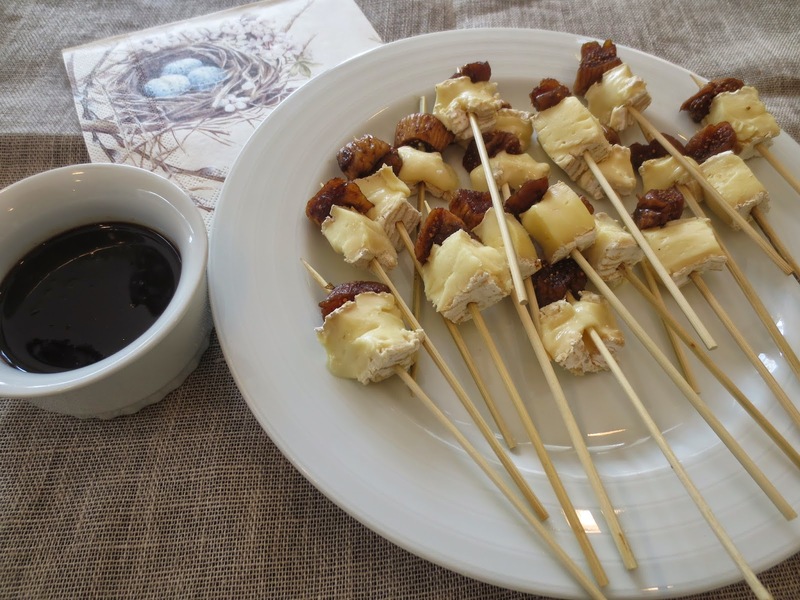 Those camembert and fig skewers look prefect for a book club meeting! I'd die to be in Toronto that day! Lovely post! Thanks for sharing this amazing recipe with us! Julie and Marcela, it would be great to see you – but I understand that distance would be an issue! Congrats on your book event! So wish I lived near you so I could go. Thanks, Lynne! If you can't make it on Saturday, I'll tell you all about Station Eleven at our next meeting! 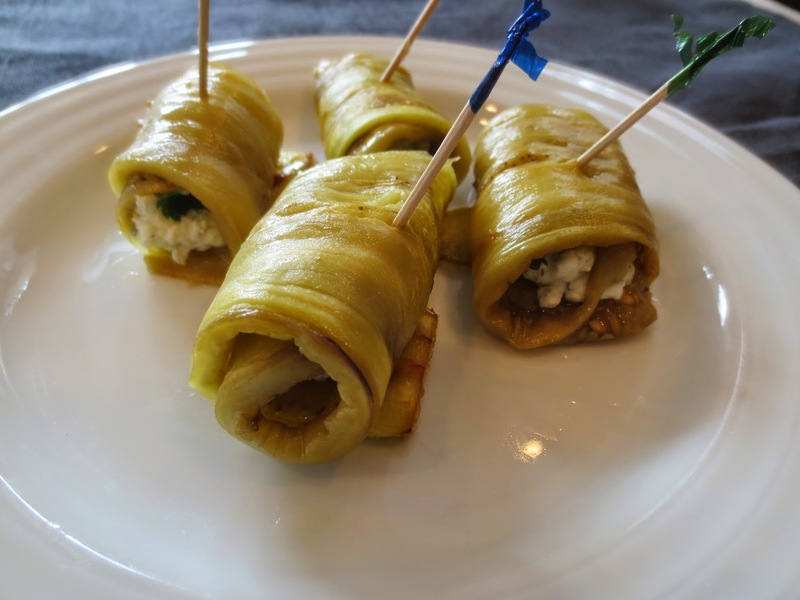 Those eggplant rolls are so inviting with goat cheese filling! Have a fun and successful book event, Beth! and to me, nothing will ever or could ever replace a (dust-gathering) physical book!! Figs and balsamic is such an awesome combo! I always read physical books too. I look at screens enough as it is. Love these look delicious Beth!! As you're telling that story it reminded me of the movie You've Got Mail and how Meg Ryan had the corner bookstore and offered that personal touch that Tom Hanks bookstore couldn't offer. Great movie! I actually didn't know you had written 3 childrens books. I'll have to check those out. Your appetizers sound wonderful and easy. I'll definitely make these. Nothing compare with the feel of an actual book in your hands (and seeing how far you've come by the shifting thickness). Excellent way to promote the increasingly rare indie book store. My these little treats look really yummy. You are such fun…all the interests you have and things you do. This book event sounds just right for you. I would love to read the books you have written…are they available in the US? To be able to write you must first be a good reader yourself. These are delicious appetizers. Figs are in season late summer here! Your appetizers sound awesome!! And I absolutely love the sound of this event. Such a great thing to celebrate! Congrats! Although I must say, e-readers are wonderful. I resisted for years, but couldn't live without mine now — such a terrific reading machine! I like that I can increase the font size when I'm on the treadmill (only way I can possibly read on the treadmill!). And as someone who's usually reading 2 or 3 books at a time, so nice to carry them around in one small package. Anyway, Love this dish! Really good — thanks. I've always wanted to write children's books! What fun! Before I die, I want to read every book in the library. I always feel as if there is never enough time! Thanks for stopping by my blog. Now I found yours! But I have sen your photo around! My mistake for not coming by sooner! Oh I wish I could come – sounds like a wonderful event. Congratulations on your books – I think that is amazing. The fig and cheese skewers are calling my name – they sound pretty terrific too – have a great Saturday! Hi Beth–what a great idea, to have a gratitude day for the independent booksellers. As my friend, who owns and runs a small but successful bookstore says, "Publishers don't sell books, booksellers do." Kayte, sorry for my late response. Yes, they're available in the US! Thanks for asking. 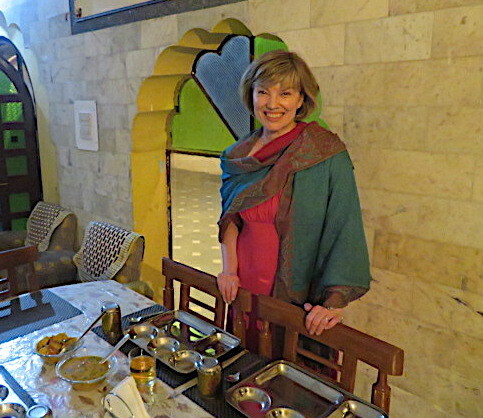 Dear Beth – now if only I lived in the Toronto area, I would most certainly drop by the book store and have you recommend some wonderful reads – I would love to get your perspective on some of the books I treasure too…Your appetizers look like fun bites to enjoy while contemplating a few good books. I added your recommendation to my list. I usually read my book club books out of the library, but the next one is in too much demand and I had already resolved to go to one of the few remaining independent bookstores to pick it up. Congrats on the event!